Ireland sealed a historic victory against Scotland on Sunday, winning at Murrayfield for the first time since 1985. The Irish rarely looked troubled by a Scottish side devoid of creativity in their back division, as they raced to their most emphatic win at the home of Scottish rugby. David Humphreys rattled off 26 points for the visitors but it was Brian O'Driscoll who was the chief tormentor for the Scots. The Irish captain regularly picked gaps in the opposition defence and, although he failed to get on the score sheet, his telling run produced Denis Hickie's opening try. Geordan Murphy and Humphreys scored the game's other tries. Ireland were the more assured throughout the game, except for a nearly disastrous hiccup with the first move of the match. A Hickie defensive kick was charged down but Andrew Mower knocked the ball forward in the resulting melee over the try line. After surviving the scare, the Irish found themselves in front after eight minutes against the run of play courtesy of a Humphreys penalty, his first of two in the half. Despite Ireland's lead, Scotland came closest to crossing the line first but were halted by the faintest of tap tackles by Peter Stringer on Glenn Metcalfe. The opening try finally came in some style after an intelligent break by O'Driscoll in the 27th minute. The Irish captain found the pace to outfox the Scots before being brought down just short of the line with his side's first real attacking opportunity. Stringer was on hand to recycle the ball to Hickie who forced his way over. Humphreys added the conversion. A Gordon Ross penalty straight after the restart, cancelled out by a similar Humphreys effort, seemed to give Scotland the wake-up call required. From looking sluggish, they produced 10 minutes of telling attacks which were continually fended off. In the end, the Scots had to settle for a second penalty. With the Scottish risking all in attack, Ireland were biding their time to launch a counter offensive, which came from replacement Murphy in the 65th minute. Against the run of play, the Leicester wing hacked the ball forward and sprinted 70 yards for the game's second try. With that the Scots completely capitulated, Hickie producing the overlap to send Humphreys through for his score five minutes later. By then, the game had long finished as a contest. Scotland: G. Metcalfe, Logan, Craig, Laney, Paterson, G. Ross, Redpath, T. Smith, Bulloch, Douglas, Murray, Grimes, Leslie, Mower, Taylor. Replacements: Scott, G. Kerr, Hines, Beattie, Blair, Townsend, Utterson. Ireland: Dempsey, S. Horgan, O'Driscoll, Maggs, Hickie, Humphreys, Stringer, Corrigan, S. Byrne, Hayes, Longwell, O'Kelly, Costello, Gleeson, Foley. 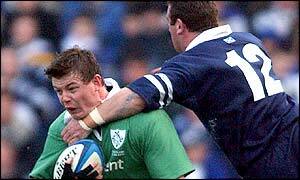 Replacements: Sheahan, Horan, Cullen, A. Quinlan, G. Easterby, Burke, Murphy. "This was a cruel lesson for Scotland"
"To put the ghost to rest like that was satisfying"